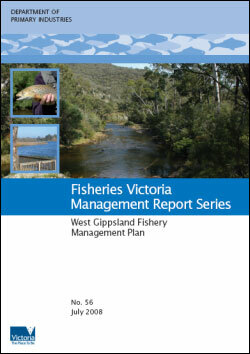 The West Gippsland Fishery Management Plan was declared on 31 July 2008. This management plan specifies the objectives, strategies and actions for managing recreational fishing activities in the rivers and impoundments across the West Gippsland region for the next five years. A process for addressing other resource management issues that can impact recreational fisheries. The West Gippsland Fishery Management Plan was developed in accordance with Part 3 of the Fisheries Act 1995 and the process was overseen by the Fisheries Co-Management Council (FCC). The plan was prepared with assistance from a steering committee which had an independent chair and representatives from the Victorian Recreational Fishing peak body (VRFish), the FCC, Southern Rural Water, the West Gippsland Catchment Management Authority and Indigenous parties. A copy of the West Gippsland Fishery Management Plan can be obtained by downloading the attached PDF file or by contacting the department Customer Service Centre on 136 186.